Learning how to measure social media ROI metrics is a tricky business. Compared to other marketing streams such as PPC campaigns, remarketing, or SEO traffic, where you have clear cut indicators of success, measuring social media metrics is a little bit of a grey area. For instance, how do you know, truly, if that Facebook post actually generated a sale? Or whether that retweet actually managed to drive any sign-ups? But don’t let that put you off! We’re here to show you that even given the above, measuring your social media ROI and KPIs isn’t impossible. And we’re not just talking about how many followers you have, or how many likes or retweets your posts get, we’re here to talk about bottom lines. Cold hard numbers that really mean something to businesses. Social Media metrics are bits of data that show how social media impacts a company’s revenue. They take into consideration social media activity, the time, money and resources spent on this activity, and drill down into how this has effected key actions such as sales, leads generated or downloads. These metrics come together to produce what is known as Return on Investment (ROI). All social media ROIs should be measured in currency units and should show; how much money goes into social media marketing, and how much money comes back out. Metrics for social media can be as complicated and varied as your imagination permits, and will be more of less important based on what your business does and its objectives. In this guide to measuring social media metrics, we are going to outline the most common metrics that a company will use. And get you monitoring them in order to understand and improve upon your social campaigns. We will then show you how to combine this to understand your ROI. These are all pretty straightforward. They will give you key insights into what you’re doing, what it’s achieving and how to make it better. And whilst you’re probably glancing at your increase in weekly followers, it’s unlikely that you’re actually drilling down into the data properly to see what impact it’s actually having on a business level. 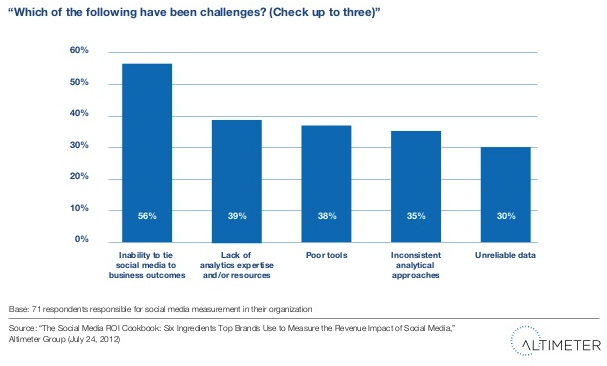 So now you know why you’re measuring your social media ROI, but where do you start? This is the absolute, must-have basis for ANY digital marketing strategy! If you don’t have well defined goals, you might as well just pack it in now, because otherwise what are you doing here? You’re stabbing at the internet blind and hoping that something will come of it. It’s the equivalent of throwing a rock into the ocean, hoping it will hit a fish, that that fish will wash up to shore and somehow barbecue itself. Importantly, you should notice that all of these goals can have very simple numbers applied to them. We had 42 trials started in the last week, and 142 mailing list sign-ups. In fact, unless your business is very one-track-minded and focuses solely on getting people to trial software, chances are your social media goals are going to be a combination of all of the above. Though don’t let this stress you out, this is good. It means that you can look at success from many angles, and combine all of this data to have an overarching view too. 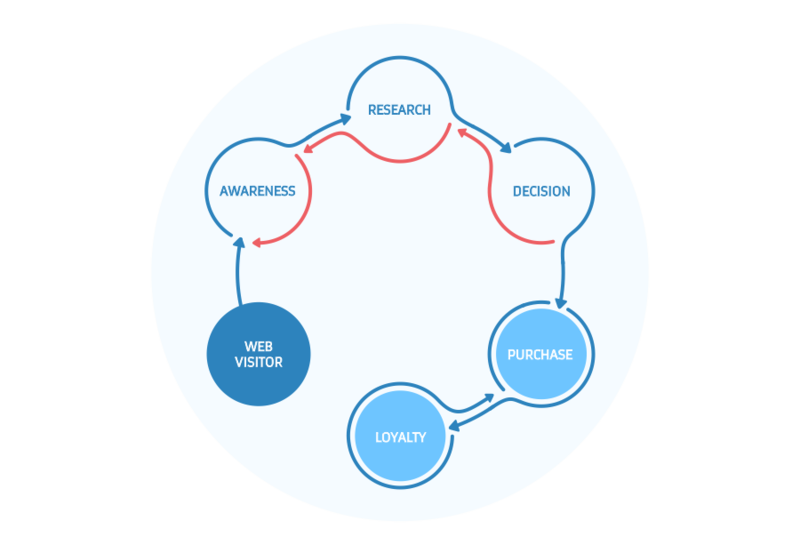 If you noticed, these goals basically follow the buying cycle for eCommerce websites. Click here for more on that. What I mean by this is that your goals should be measured from generating a customer’s initial awareness of your company to the final sale. Of course, we want to retain customers and get them coming back too, but let’s leave that for now. Once you have your goals set up, and have decided what data points they will be defined by, you need to create a campaign that matches up to this specific goal. If you are looking to increase awareness of your brand, for instance, you want to create a campaign that approaches people who aren’t already your followers. If it’s trial sign-ups, remarketing to website visitors offering a ‘temporary free trial’ might be the way to go. What campaigns you set up will be down to you, and we’re not going to go into depth on that here. But one thing you need to be sure you’re doing is tracking each campaign individually. This can be done by creating custom URLs with UTM parameters. Without going into too much detail, these are little appendages to the URL which allow you to track certain information, such as where the click came from and what campaign it was as a result of. For more information on UTM parameters, check out blog here. 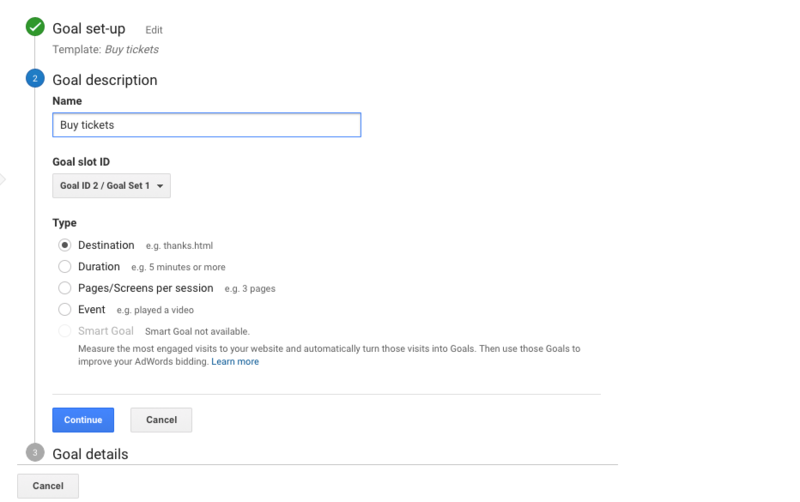 This can be a complicated process and you may want to read up on using Google Auto-Tagging instead to achieve this. If you have set up your goals and created campaigns, you will now need to set up tracking of social media metrics. Although there are a whole host of tools available for this task, Google Analytics is pretty much all you need and is easy enough to use if you have some technical knowledge. Begin by logging into your Google Analytics dashboard, and navigating to the ‘Acquisition’ tab in the left-hand-side menu. From here click on Social > Conversions. Here is where you will find whether your social media campaigns are driving your goals home. In order to do this you will first of all need to set up a goal. Do this by going to Admin > View > Goals. Again, what goals you set up will be down to you, but let’s look at creating a goal for buying tickets. For something like buying tickets, you will want to send your user to a custom URL after purchase in order to track where they came from. This is where UTM parameters will come into play and be sure to give you accurate results. If you just use a generic URL, you will still retrieve purchase data, but won’t be able to analyse it properly. Alternatively, if your goal was to get someone to view a video, or click a link, you will set up an ‘event’ goal. 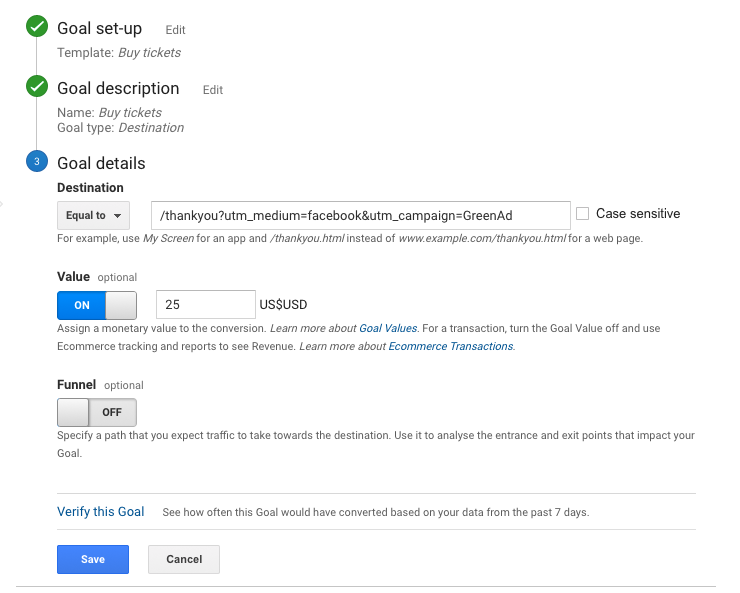 In the example above we have used UTM parameters to track social media campaign called ‘Green Ad’ from Facebook. You don’t need to create URLs in the same way, but importantly, you need to make sure the URL that you enter is only reachable by clicking certain links, and isn’t indexed by Google. You can do this by creating a robots.txt file and excluding the URL from indexing. Multiplying the lifetime value of your customers by the conversion rate will show you the potential value of each visit to your website. In this case the conversion rate will be rate of visitors to your website that become buyers. Click here for more information on calculating life time value. When final purchases is the aim of your goal, the average sale will be the value you enter here. Wages paid to staff for specific time spent on social campaigns. Content writing and graphic design costs. Of course this list isn’t exhaustive, and you will want to add any other costs that your company incurs, but make sure that it is directly traceable to spend on social media otherwise it will make your social media ROI inaccurate. In this case revenue should be based on the amount of money you have taken per campaign in order to give you your ROI per campaign. Adding the costs of all revenue from all social campaigns and dividing by all costs will give you your total social media ROI. Doing two calculations will help give you an overarching picture of social spend, as well as an insight into which campaigns, or which social channels are working best for you. In turn, this will help you refocus, re-budget and optimise future campaigns. Don’t go firing your social whizz just yet… Whilst we have ignored them here, other social metrics such as followers and retweets do certainly have their part to play and are a strong indictor that your campaigns reflect your user-base or audience. They just don’t factor into your ROI. Want to speak to someone about optimising your social spend and improving your ROI?